Along with the exotic animal kingdom on land, our planet is also blessed with an equally exhilarating marine life. In order to explore wildlife in the truest sense, one needs to dive into the oceans. From outer space Earth looks something like a blue marble. That’s because most of Earth’s surface, more than 70 per cent, is covered by the oceans. These waters house about one million species of animals. In fact, the largest animal to live on Earth is the gigantic mammal- the blue whale. The ocean also teems with plant life and coral reefs that serve as a habitat for creatures. Besides, the ocean showcases the most colourful spectrum of life you’ll see anywhere. Like the Big Five of the land-lions, elephants, leopards, buffalo and rhinos-that crisscross the African Savannah, for your next holiday, consider visiting the big five of the ocean i.e. whale sharks, giant manta rays, humpback whales, dolphins and tiger sharks. The popularity of the undersea wildlife is growing phenomenally. Snorkelling may be the most popular way to explore the aquatic life but if you want to up the adventure quotient, shark cage diving is the way to go. Locked up in a submerged steel cage, these giant aquatic predators are lured with chum (dead fish). Enjoy a close encounter with these awe-inspiring yet dangerous creatures in their very own habitat and observe the natural behavioural patterns of these predators. œ ISLA GUADELUPE, MEXICO: Isla Guadelupe occupies the first spot in the list of Great White diving sites. With up to 100 feet of visibility and wonderfully warm waters, it is a paradise for novices and experts alike. You can choose from expeditions that range from a day or six-day long adventure. œ STEWART ISLAND, NEW ZEALAND: New Zealand’s third largest island, Stewart Island boasts of an 85 per cent area reserved as a national park. The island is a true wilderness of isolated beauty. Titled as Rakiura, or Glowing Skies, in Maori, it’s a haven for cage diving with Great White Sharks. Besides, Stewart Island is a magnet for nature lovers and hikers alike. œ TIGER BEACH, BAHAMAS: If you’ve already tried shark cage diving and are looking for a new terrifying twist, try cage free diving in the Bahamas. As the name suggests, you will dispense freely in the waters to swim with the sea scavengers. Although Tiger Sharks can be curious in the water and must be approached with a great deal of respect, cage free diving with these creatures is apparently perfectly possible. If you’ve got the guts, you know where to go. About 6,500 breeding pairs of Gentoo Penguins call Cuverville Island, Antarctica home. 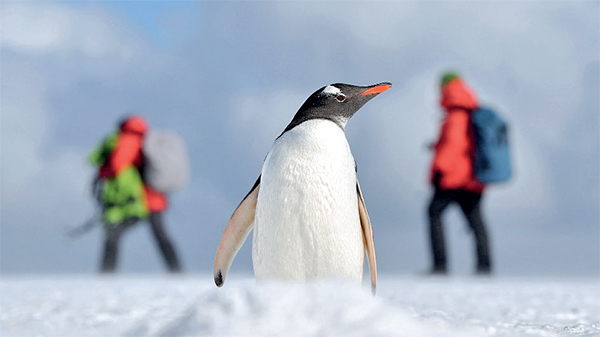 Antarctica has gained popularity as a supreme travel destination for the true adventure traveller. Once here, when you are out kayaking or cruising waters, you’ll may find that whales aren’t running the other way. Humpback and Minke Whales are just a few of the regulars spotted in these chilly waters. Apart from the whales, penguins are another most common inhabitants in the Antarctic. Living in colonies with populations larger than some cities, and surviving in the harshest of conditions, it is no wonder that penguins are seen as the icon of Antarctica. However, of the 17 different species of penguin, only two (Emperor and Adelie) make the Antarctic continent their true home, although others (chinstrap, gentoo and macaroni) breed on the northern tip of the Antarctic Peninsula, where conditions are less harsh. The best place to enjoy the frolicking of penguins would be at Paradise Bay. The snow-capped mountains in the background with the little creatures happily scampering about is quite a sight. In terms of wildlife, there is more to see than just penguins. Sometimes leopard and Weddle seals beach themselves on shore to relax after a meal. Whether you are a recreational diver or exploring under the sea is your full-time job, Thailand is equipped with some of the most wellknown dive site in the world. People flock to Thailand for its stunning beaches. Its long coast line offers access to an exhilarating marine life for underwater enthusiasts. These places vary from wild current swept rocky landscapes to gentle sloping coral reef. In Hin-Daeng and Hin-Mouang also known as the red and purple rock, you can swim with the gray sharks and manta rays. The site is a feeding ground for pelagic fish, allowing you to see lots of large creatures during your dive. A boat ride away from Phuket lies Koh Dok Mai, which is famous for its night dive. Keep an eye out for eels peaking out of the yellow tube corals. Head out to the small cave, which leads to a huge cavern with fairly strong currents adding to the whole thrill and excitement of this dive spot. In addition to the moray eels, watch out for large soft corals, sea horse, and leopard sharks that often lurk around. 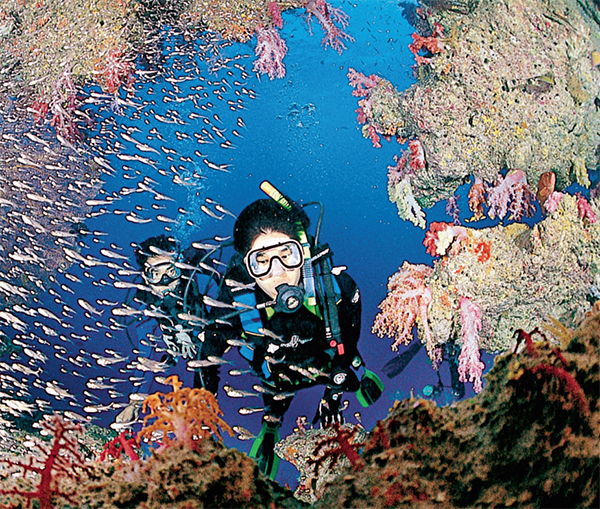 One of the best diving sites in Thailand is around the Richelieu Rock, a horseshoe shaped rock in the Andaman Sea. Barracuda tornadoes and schools of tropical fish are a captivating sight for underwater photography enthusiasts. Be sure to spot seahorses, pipefish, cuttlefish and even shovel nose rays while you are there. A sperm whale calf swims next to its mother and a pod of sperm whales off the coast of the Agat Marina in Guam. The tiny island of Guam, a US island territory in Micronesia, sits in the Philippines Sea. Take to the open seas in search of the playful spinner dolphins that live along the coast of Guam. Enjoy the sunshine and the wind in your hair as you cruise out from Fish Eye Marine Park on a highspeed boat, and learn about the dolphins from your friendly skipper and guide. Board your sporty cruiser boat at the Agat or Hatgania Marina, and meet your amicable guide. As you move closer toward your destination, you might spot schools of skipjack tuna or flying fish leaping into the air around the boat. Soon, you encounter a pod of spinner dolphins-small dolphins that flourish in the tropical waters of Guam. Your guide educates you about the creatures that thrive in the waters. Furthermore you can try your luck at bottom fishing when the boat is anchored. 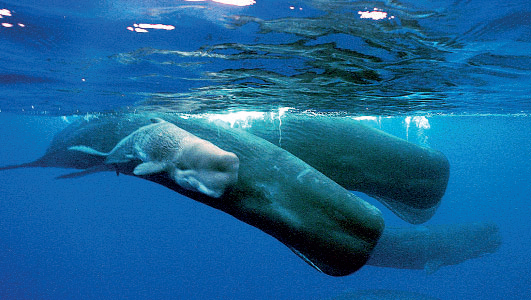 Besides, you also stand a chance of spotting a pod of sperm whales, a few miles off the coast of the Agat Marina. Curious dolphins can be watched from close during a kayaking adventure in Scotland or Wales. UK is rewarded with many strips of water where large marine life, known as mega fauna thrive. The sites range from the north east coast of England to Anglesey in Wales and the Irish Sea. Instead of gazing at the dolphins from the comforts of your boat, we recommend trying a kayaking expedition to get up close to these adorable creatures. Besides, kayaking can be a great way of viewing marine wildlife both above and below the water if the sea is calm and clear. Dolphins are naturally social animals, and are known for their playful behaviour. 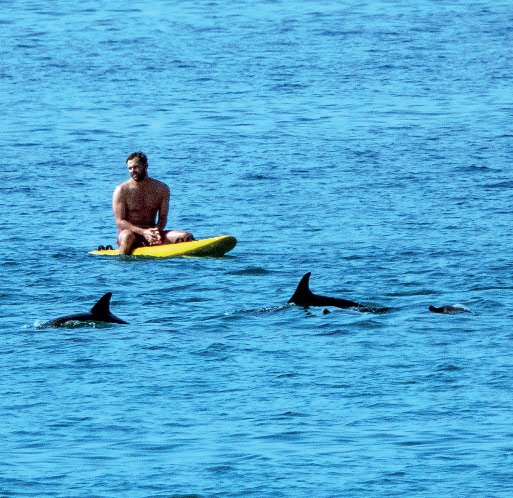 The dolphin kayak tour segment allows you to greet dark grey coloured dolphins with a near white underside. The inquisitive dolphins can often be seen close to shore. Kayaking can be a great way of viewing marine wildlife both above and below the water if the sea is calm and clear. It is highly recommended that you paddle from one coast to another. Start by Fort William and paddle to Inverness on the opposite side of the country. The Great Glens Canoe Trail in Scotland makes for a great trip in a kayak too. The tusk of a male Narwhal as it peeps out of the icy water. The narwhals and polar bears are the babies of the Arctic kingdom. 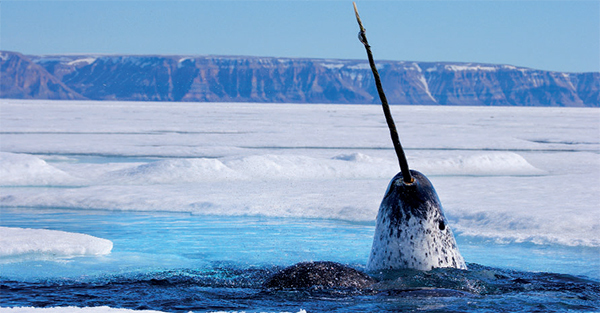 Narwhals, the unicorns of the ocean, are tusked fish that dwell in the far northern reaches of Canada. Head to Baffin Island, a northern island territory of Nunavut. The region sees an intersection between the sea and glacial landscape. This has given it a unique ecosystem comprising marine mammals and other wildlife. Experience the Arctic landscape; catch a glimpse of narwhals leap out of water and polar bears enjoying adorable family time with their little ones. Narwhal and polar bear safaris are a popular attraction here. You can opt for a guided safari that gives you the option of swimming with the narwhal if the opportunity arises. Those who prefer not to get wet can relax and watch them from the safety of the floe edge. Apart from the two majestic creatures, you can also spot harp seals, bearded seals, ringed seals, bowhead whales, and beluga here.